An explosion and subsequent fire that lasted 16 hours has killed two workers at an Evonik Industries chemical plant in Marl, Germany. The cause of the March 31 accident remains unknown but is under investigation by both government authorities and an Evonik contractor. The accident occurred in the early afternoon at a plant that produces cyclododecatriene, an intermediate used to make nylon 12, flame retardants, flavors, and fragrances. One worker was killed immediately, and hours passed before his body could be recovered. A second worker, who suffered severe burns, died of his injuries two days later. During the blaze, some unspecified amount of the carcinogen butadiene did leak, an Evonik spokeswoman says. 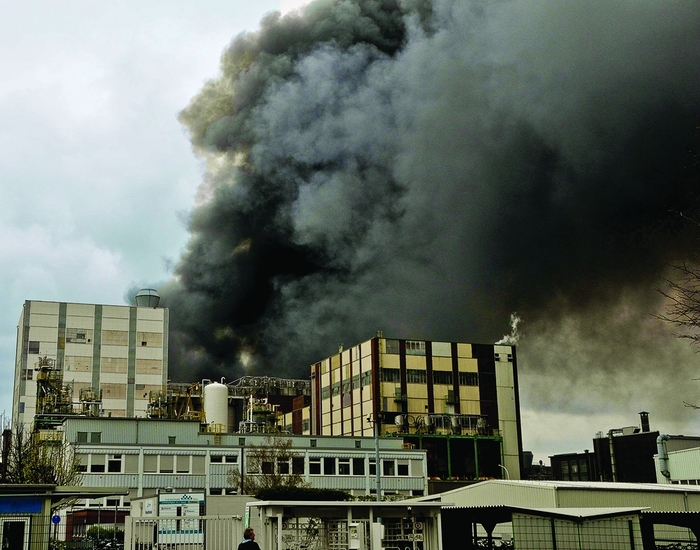 However, she says, the chemical was consumed by fire, which accounted for the black smoke billowing from the plant site. The public was never at risk from exposure to butadiene, and no other chemical was involved in the blaze, she adds. At C&EN’s press time, Evonik did not know the full extent of damage to the Marl plant, but it expects “substantial constraints” for the time being on its output of nylon 12, used in auto parts, photovoltaic modules, and sporting goods. The firm says the accident has not affected output of other plastics made at the site, including the engineering polymers polybutylene terephthalate and polyether ether ketone. About 10,000 Evonik employees work at the 2.5-sq-mile Marl site, which is also home to 30 other chemical-related companies. Accidents are infrequent in the German chemical industry. Chemical workers in Germany suffered 9.4 accidents per million hours worked in 2010, according to the German Chemical Industry Association, compared with 41.6 in construction, 9.8 in health care, and 16.5 for all industries. In the U.S., chemical workers experienced 11.0 accidents per million hours worked, according to the U.S. Bureau of Labor Statistics. Evonik itself recorded just 1.3 accidents per million hours worked company-wide in 2010 and no deaths.